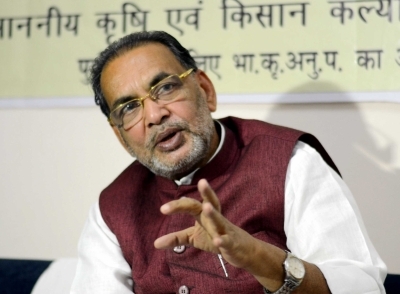 Motihari, Oct 28 (IANS) Union Agriculture Minister Radha Mohan Singh on Saturday said that India was emerging as a leader among the milk-producing nations as it produced 163.7 million tonne milk in 2016-17. He also said that the central government had released Rs 499.08 crore to states under Rashtriya Gokul Mission, with an objective to conserve and propagate indigenous breeds in an organized and scientific manner. “In 2015-16, total milk production in Bihar was 8.29 million metric tonne, which was 5.33 per cent of the whole country. Bihar has 6.67 per cent of the country’s total cattle population. Therefore, there is a need to increase milk production and productivity in the state,” Singh said at the Pashu Arogya Mela in Bihar’s Motihari, an official statement said. He said dairy farming has been a traditional source of livelihood and it has a deep connection with the agricultural economy. As per the statement, currently, there are 19 crore cattle in the country, which amounts to 14 per cent of the total cattle population of the world. The Central government had allocated Rs 67 crore to Bihar under the mission and Rs 22.5 crore were sanctioned for the implementation of this scheme so far, he added.